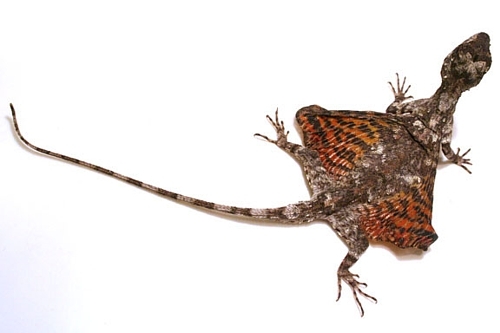 The Flying Dragon, native to the rain forests and rubber plantations of Asia and the Indies, is a small lizard that can, when spreading a move able flap of skin that is attached to its movable ribs, form wings for gliding from tree to tree, and is able to cover distances up to 25 feet. The wings, when folded, give them camouflage, being orange, red, blue as well as striped and spotted. The Flying dragon is brown with blue colors on the underside of its “wings” and a yellow dewlap. 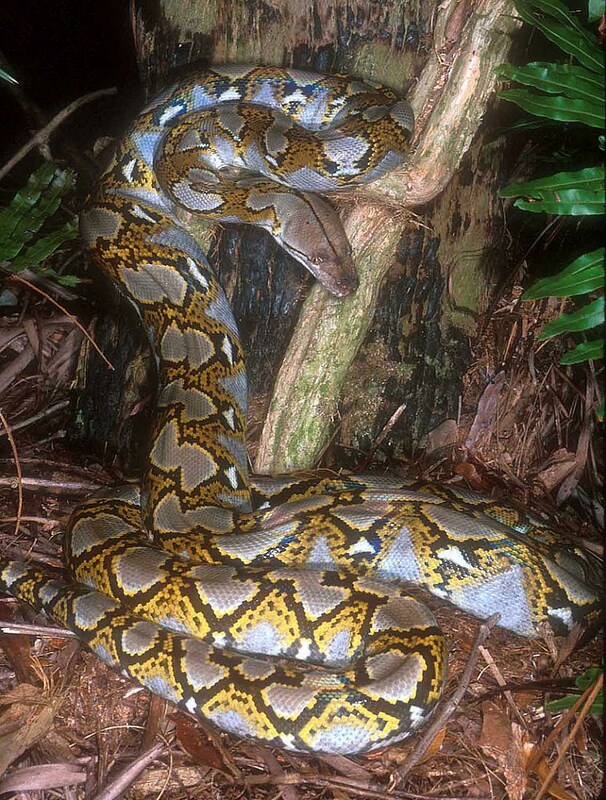 The female of the species tends to be more blue and yellow in coloring. Flying Dragons have low, long bodies, flaps of skin and grow to be about twelve inches long when fully mature, with the female being slightly larger than the males. They have very sticky tongues, which they use to catch their main prey, ants and termites, are the primary food on which they subsist. The Female Flying Dragon, during breeding season will make her one and only trip to the forest floor, where she will lay 1 to 5 eggs, and bury them in the warm damp soil. She does not care for the eggs when they hatch, nor wait for them to do so. The Flying Dragon has a range that extends from the Philippines to Malaysia and Indonesia. When in the wild they will usually claim a small territory, and mark the trees in the area as their own. Usually one to three female Flying Dragons will live in each tree. When the male Flying Dragon meets another animal, he may perform a combination of dewlap or wing extension, or bob his body up and down. Extending the wings and dewlap makes the Flying Dragon appear larger, and he will usually exhibit such behavior if he feels threatened. Flying Dragons are diurnal and hide in the late morning and early afternoon to avoid the most intense sunlight of the day.